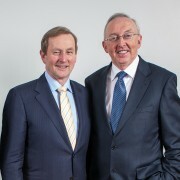 Photo: Consul General of Ireland, Gerry Stanton (right) stands with fellow Mayo man, Taoiseach(Prime Minister) Mr. Enda Kenny. at the Consulate General of Ireland, San Francisco after summer and retire to Ireland. Staunton took the role of Consul General of Ireland, for the Western United States August, 2008.
assistance to Irish citizens in Alaska, Arizona, California, Colorado, Hawaii, Guam & The Marianas, Idaho, Montana, New Mexico, Nevada, Oregon, Utah, Washington and Wyoming. In addition to his responsibilities to Irish citizens, Staunton quickly gained a reputation for reaching out to the Irish American communities in his territory in hopes to create and strengthen economic, social, and cultural ties between the U.S. and Ireland. He made noticeable trips to Colorado where he was instrumental in coordinating a visit by Irish Ambassador Michael Collins as well as spearheading the development of the Irish Network Colorado (INCO). INCO is a business network that connects Irish expatriates, Irish-Americans and friends of Ireland, to provide a forum for social, business, and professional networking. (Photo caption) Denver native (via Belfast) Susan Morrice, Chairperson of Belize Natural Energy (BNE), embraces Erin Ryan, Human Resources Manager, and Dr Gilbert Canton CEO, as their company was announced winner of GetEnergy Global Education and Training in Exploration Award June 4th in London. On June 4, company representatives for Belize Natural Energy (BNE) traveled to London to receive the GetEnergy 2013 Global Education and Training in Exploration Award. GetEnergy is a global education and training marketplace for the oil and gas Industry. The GetEnergy Annual Global Event is unique, in that it is the only place where oil and gas companies can meet and build partnerships with education and training providers from all over the world. Adult Education Programme participants, video production team, the Belize Natural Energy family and all those in Belize and throughout the world who took the time to place their votes. It was reported that your overwhelming support “crashed” the GetEnergy Awards website. Dr. Gilbert H. Canton, who is a Belizean and President & CEO of BNE said on the company website, “…Even though BNE is still in its early stages of development, our efforts have made a significant impact on the socio-economic development of Belize through income and employment generation, foreign exchange earnings, health and education support activities, and community development. ireland made simple (5mm bleeds)-2Planning a trip to Ireland but don’t know where to start? Wish you knew a local? Someone who you could sit down with and pick their brain about traveling right in Ireland? Well meet your new Colorado based travel consultant, Ireland Made Simple! Ireland Made Simple is the brainchild of newlyweds, Julian and Erica Bourke. Julian from Limerick, and Erica from Dublin, moved to Colorado this past April on a bit of a whim. According to Julian, their original thought was to take an extended visit somewhere laid-back and close to the great outdoors -maybe Canada. While on their honeymoon in Thailand, the Bourkes mentioned the idea to a fellow tourist from the States who advised that they check out Boulder, Colorado. Wind beneath the wings was given by the fact that Julian already holds dual citizenship with the U.S. and Ireland since his mom was born in Tennessee. Now, the Bourkes love the Rocky Mountain Region so much that Erica is in the process of becoming a U.S. citizen. One thing the Bourkes noticed about their new home, was the lack of Irish accents in the western United States; and, of course the first thing their new friends recognize are the Bourke brogues. As much as Julian would like to give his clients tips on getting off the beaten path, he does appreciate some of the tourist sights and that people desire to see them. Whether you want to visit one or all of Ireland’s 32 counties, travel as an individual or group, Julian and Erica at Ireland Made Simple believe that they can help design your own unique trip. If you are planning a trip to Ireland, Julian asks that you contact him and discuss budget and interests. XJet employees and family members gave XJet founder Josh Stewart a big surprise greeting last month as he returned to work at XJet facility Denver’s Centennial Airport. With champagne bottles popping and the table set for celebration Josh arrived beaming ear to ear. He had just returned from the United Arab Emigrates where he had sign an agreement to move the private jet club’s operational headquarters to Dubai World Central’s Aviation District. A native of Belfast, arrived in the US in 2004, committed to realizing his dream of creating a new company to offer the highest level of services to private jet owners and users. That year, the United States was home to approximately 60% of the worldwide business aviation fleet supported by the Fixed Based Operator (FBO) business model. Mr. Stewart recognized there was a great opportunity to transform the traditional FBO model, which focuses on pilot relationships and relies heavily on fuel sales for its profitability, to a model that focuses on servicing the jet owner while providing more stable and predictable profitability. Thus, the concept for XJet was born. With the support of some local investors and jet owners, XJet initiated development in Denver in early 2005. The goal was to develop a business model from the ground up to support the private jet owner, focusing on world class asset protection and security with hangarage, Seven Star Service, lifestyle support through dedicated 24/7 concierge and transparent economics. XJet opened its revolutionary private jet club at Denver’s Centennial Airport (APA) in 2007, offering the aircraft owner the finest facilities and service available in the industry. At a time where many existing FBOs were struggling for survival, XJet continued to refine its unique brand of Seven Star Service and opened to transient customers in 2009. The company has achieved double-digit growth since inception and currently ranks as the #1 service provider in the US. The company has held that ranking for two years (AIN & Pro Pilot magazines). U.S. The company identified the United Arab Emirates as a key market for global expansion early in its development and has now signed a deal with Dubai World Central (DWC) to build a world-class terminal and global headquarters. With a projected doubling of private jet movements within the next five years, this region provides a tremendous opportunity. In addition, the company is also in various stages of expansion to other U.S. and international locations, such as Kona, Hawaii and Paris, France. Ireland Ambassador Collins moves on to Germany: Anne Anderson to be first female Ambassador to U.S. 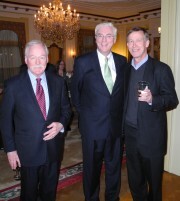 Ambassador Collins visited Colorado in November 2011. He and his entourage spent a couple of days visiting regional government officials (including a reception at Governor’s Mansion), toured Covidien, the Irish-owned international medical equipment, supplies and pharmaceutical company in Boulder, met with local Irish organizations, and was given a backstage tour of Red Rocks Amphitheater by Barry Fey, the concert promoter who brought U2 to Denver and introduced them onstage at Red Rocks, the site of their famous Under a Blood Red Sky music video.